The SWAP model was designed for quickly estimating the neurologic outcomes of patients with out-of-hospital cardiac arrest who receive cardiopulmonary resuscitation. 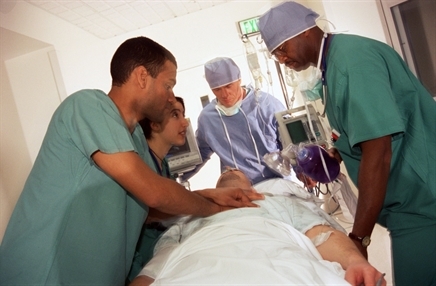 The SWAP scoring model is a simple, useful predictive tool for the rapid and early estimation of prognosis for patients with out-of-hospital cardiac arrest, according to a study published in Annals of Emergency Medicine. The investigators of this prospective observational study sought to design a simple and useful scoring model (SWAP; shockable rhythm-witness-age-pH) for quickly estimating the neurologic outcomes of patients with out-of-hospital cardiac arrest who receive cardiopulmonary resuscitation (CPR) after their arrival at an emergency department. The study included 852 patients with out-of-hospital cardiac arrest who were sent to the emergency department of China Medical University Hospital from January 2015 to June 2017. The investigators first performed multivariate logistic regression analyses to identify 4 independent factors associated with unfavorable outcomes from out-of-hospital cardiac arrest: having initial nonshockable rhythm (odds ratio [OR] 3.40; 95% CI, 1.58-7.32), no witness of collapse (OR 3.19; 95% CI, 1.51-6.75), being older than 60 years (OR 3.65; 95% CI, 1.64-8.09), and a pH of 7.0 or less (OR 3.27; 95% CI, 1.42-7.54). Based on these factors, the SWAP scoring model was constructed, in which each predictor was assigned 1 point. A validation cohort of 859 patients admitted to the emergency department for out-of-hospital cardiac arrest from January 2012 to December 2014 was used to confirm the ability of SWAP scores to predict unfavorable outcomes. Baseline characteristics between the derivation and validation cohorts were comparable. In the derivation cohort, 9 of 19 patients (47.37%) with SWAP scores of 0 were discharged with a favorable neurologic outcome; however, only 1 of 502 patients with SWAP scores of 4 had a favorable outcome. In assessing the SWAP scoring model’s performance, the specificity for unfavorable outcomes associated with a SWAP score of 4 was 97.14% (95% CI, 91.62%-100%) in the derivation cohort and 100% in the validation cohort. One limitation to the study was including a study population that consisted only of individuals with out-of-hospital cardiac arrest who did not have return of spontaneous circulation before being treated in the emergency department. The incidence of shockable rhythm was low among the cohort, which may affect the use of SWAP in non-Asian populations. Furthermore, international guidelines for CPR and emergency services policies changed during the study period. The investigators suggested that the simple SWAP scoring model may provide useful information to help physicians quickly estimate the neurological outcomes of patients with out-of-hospital cardiac arrest. Future research should validate the SWAP score’s reliability and popularity for the rapid prognosis of patients with out-of-hospital cardiac arrest among other populations.